A minibus driver was stuck by the side of the road because his tyre had burst, but two heroes came to his rescue within two minutes to help replace the tyre. They were responding to a Facebook post on SG Roads Vigilante's page appealing for volunteers to help the driver at a bus stop near Block 793 Woodlands Avenue 7, on Oct 17 at 6.58pm. Stomper Jayden alerted Stomp to the post he saw online and Stomp reached out to the man who posted the appeal on Facebook. The man would like to only be known as SAQ. SAQ saw the minibus driver standing with his stationary minibus by the side of the road. SAQ, a driving instructor, was in the middle of a driving lesson with a student when he stopped to check on the minibus driver. SAQ said: "I was going straight about to turn right when I saw the minibus and the driver. Going past him, he seemed tired so I decided to help. I stopped behind the driver after making a U-turn, and saw that he was sweating." SAQ spoke to the driver who said that he did not want to call a tow truck. He said he tried to remove the nuts holding the tyre in place, but it would not budge. Since SAQ was in the middle of a lesson, he did not have time to stay for long to help the minibus driver. He then decided to post an appeal on Facebook. In the post, the caption said: "Can anyone help this uncle remove his burst tyre. "The 3 nuts on the rear wheel very hard to remove. "He is at Woodlands Avenue 7 Blk 793 bus stop, right after Admiralty MRT towards Gambas. "He’s still there as at 6.58pm. Those who pass by please update if anyone is already helping, so not so many people go there." The post included a Google Maps link to the minibus driver's location. Two minutes after he posted the appeal, Facebook user Airee Aziz had commented to ask if the driver was still there and that he would be coming to help. SAQ replied to Airee and said he was still at the location. However, SAQ could not stay for long. He said he had to leave 10 minutes after he posted the appeal and could not wait for anyone who was helping to arrive, as he had to continue with his driving lesson. Five minutes after he left, another Facebook user, Bernard Koh had responded. Within fifteen minutes at 7.30pm, the two volunteers had reached and were helping the minibus driver. The tyre was replaced by 8pm. 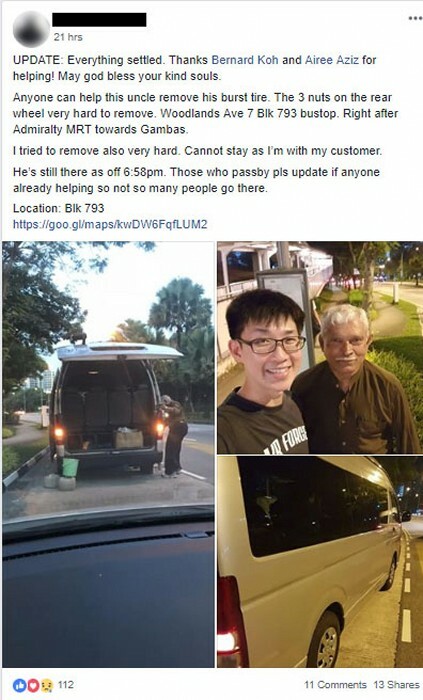 SAQ updated the post at about 8.20pm to say that the minibus driver's tyre was replaced and thanked the two helpful men. Stomper Jayden said: "I found the incident very interesting. I would not have thought of posting a plea for help on Facebook. "It was a big surprise to me because I thought no one would help, but two men actually came forth about 15 minutes after the post was up." Grab driver provides lollipops and water for passengers: "If I can give him more than 5 stars, I would!"